Question: voom variance modeling: lowess curve fitting notation wrong? 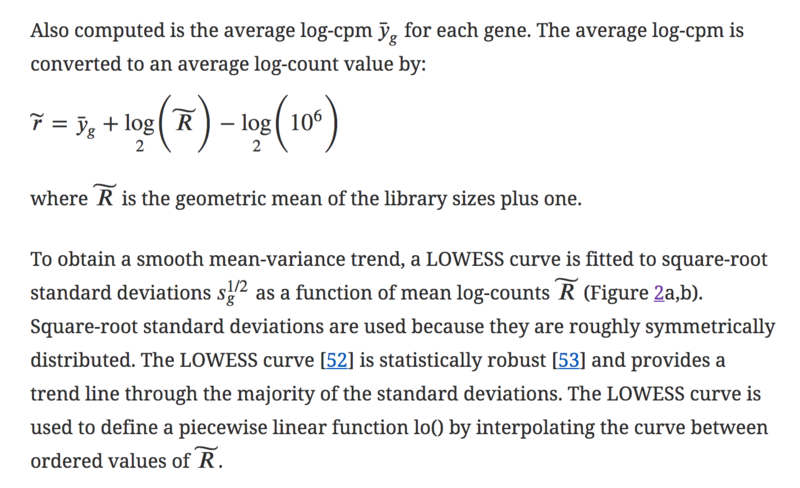 In particular the following line doesn't make sense to me " a LOWESS curve is fitted to square-root standard deviations 𝑠1/2𝑔 as a function of mean log-counts 𝑅" but it seems to me we'd really like to fit the LOWESS curve as a function of r which is the mean gene level count and not R which is the geometric mean of the library size. I think this is the case as we'd like to model variance by the mean log count of each gene and then use that to model the variance of each observation with a similar log count. I'm not sure what it would mean to model the square-root standard deviations as a function of the library size. Can someone clarify for me whats I'm missing here? You should post this at http://support.bioconductor.org - that is where the authors of Limma will answer you (and the official place to repport buts for Bioconductor packages). How to calculate uncertainty in bacterial growth rates?